Fujitsu has emailed HEXUS today to trumpet its achievement in developing hardware capable of the world's fastest wireless transmission speeds of 56Gbps. 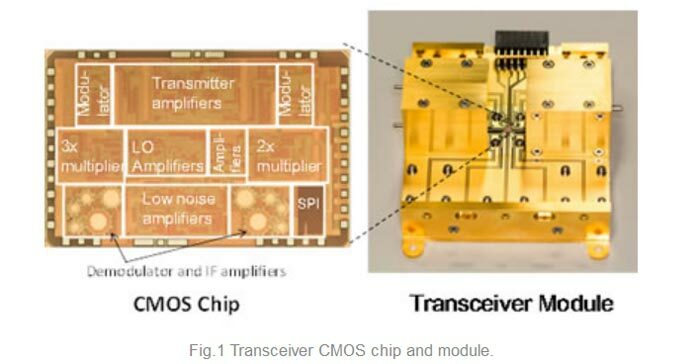 Working closely with Tokyo Institute of Technology, Fujitsu Laboratories developed a new CMOS wireless transceiver chip that can process signals at high speeds with little loss across a broad range of frequencies, from 72 to 100 gigahertz (GHz). The pair also modularised their wireless technology and tested it up to transmission speeds of 56Gbps. Tokyo Institute of Technology and Fujitsu Laboratories' new tech is said to be of great utility to mobile network providers, for example, as it uses the millimetre-waveband (30-300 GHz), "where there are few competing wireless applications, and which are capable of large-capacity communications". In the press release Fujitsu says the major challenge of the project was designing CMOS integrated circuits to work with such high frequencies "as the circuits need to be designed to operate near their limits". Nevertheless the researchers have been successful in designing and producing the chips you see pictured below. It is planned to make use of this new technology in wireless trunk lines for cellular base stations from around 2020. In other Fujitsu news today the corporation announced it has developed a next-generation 56Gbps transceiver circuit with world's lowest power consumption for optical communications between servers. The new tech offers approximately double the speed of data transfers between semiconductor chips, used in servers and switches, and optical modules - without any increase in power consumption. It is envisioned that the Fujitsu Laboratories and co-developer Socionext's tech will appear in next-gen servers and switches. Interface components featuring the newly developed technology are expected to be commercialised from fiscal 2018 onwards. At this frequency your router will levitate.Please include a Plexiglas tube.